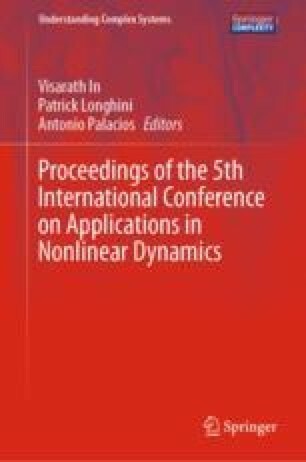 This paper presents an electronic implementation of a controller for an exact solvable chaotic oscillator. The controller uses a proportional feedback control scheme to stabilize the chaotic oscillator, with both analog and digital components. The analog hardware implementation uses commercial-off-the-shelf (COTS) digital logic components and an analog feedback path in order to generate a control signal that produces small voltage perturbations in the oscillator’s trajectory. The digital portion of the control effort is contained on a single microcontroller, which contains the information to be encoded into the chaotic oscillator. The perturbations are aperiodically applied using a clock that is generated from the oscillator’s output signal so that the pulses can be applied to the oscillator at the correct times. In order to achieve different stabilized orbits, a variable gain stage was added to the controller, using an operational amplifier and a potentiometer, such that the magnitude of the control pulses can be adjusted. This controller is used to demonstrate stabilization of various periodic orbits in a double scroll exact solvable chaotic oscillator, which is shown in the time domain and in phase portraits. This type of controller could be used to encode information into chaotic waveforms for communication systems.